Man Hon Cheung is a Research Assistant Professor in the Department of Information Engineering at the Chinese University of Hong Kong (CUHK). He received the B.Eng. and M.Phil. degrees in Information Engineering from the CUHK in 2005 and 2007, respectively, and the Ph.D. degree in Electrical and Computer Engineering from the University of British Columbia (UBC) in 2012. He received the IEEE Student Travel Grant for attending IEEE ICC 2009. 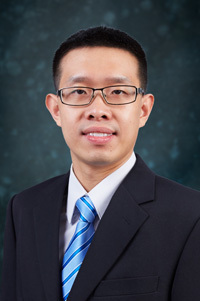 He was awarded the Graduate Student International Research Mobility Award by UBC, and the Global Scholarship Programme for Research Excellence by CUHK. He serves as a Technical Program Committee member in various conferences, which include IEEE Infocom, WiOpt, ICC, Globecom, and WCNC. His research interests include the design and analysis of wireless network protocols using optimization theory, game theory, and dynamic programming, with current focus on mobile data offloading, mobile crowdsensing, and network economics. Man Hon Cheung, Haoran Yu, and Jianwei Huang, "Mobile Data Offloading for Heterogeneous Wireless Networks," in Key Technologies for 5G Wireless Systems, Cambridge University Press, 2017. Man Hon Cheung, Fen Hou, Jianwei Huang, and Richard Southwell, "Congestion-Aware Distributed Network Selection for Integrated Cellular and Wi-Fi Networks," accepted for publication in IEEE Journal on Selected Areas in Communications (Special Issue on Deployment Issues and Performance Challenges for 5G), 2017. Haoran Yu, Man Hon Cheung, George Iosifidis, Lin Gao, Leandros Tassiulas, and Jianwei Huang, "Mobile Data Offloading for Green Wireless Networks," accepted for publication in IEEE Wireless Communications (Special Issue on Green Networking & Computing in 5G), 2017. Haoran Yu, Man Hon Cheung, Lin Gao, and Jianwei Huang, "Public Wi-Fi Monetization via Advertising," accepted for publication in IEEE/ACM Transactions on Networking, 2017. Haoran Yu, Man Hon Cheung, and Jianwei Huang, "Cooperative Wi-Fi Deployment: A One-to-Many Bargaining Framework," IEEE Transactions on Mobile Computing, vol. 16, no. 6, pp. 1559-1572, June 2017. Junlin Yu, Man Hon Cheung, Jianwei Huang, and H. Vincent Poor, "Mobile Data Trading: Behavioral Economics Analysis and Algorithm Design," IEEE Journal on Selected Areas in Communications (Special Issue on Human-In-The-Loop Mobile Networks), vol. 35, no. 4, pp. 994-1005, Apr. 2017. Junlin Yu, Man Hon Cheung, and Jianwei Huang, "Spectrum Investment under Uncertainty: A Behavioral Economics Perspective," IEEE Journal on Selected Areas in Communications (Special Issue on Spectrum Sharing and Aggregation for Future Wireless Networks), vol. 34, no. 10, pp. 2667–2677, Oct. 2016. Haoran Yu, Man Hon Cheung, Longbo Huang, and Jianwei Huang, "Power-Delay Tradeoff with Predictive Scheduling in Integrated Cellular and Wi-Fi Networks," IEEE Journal on Selected Areas in Communications (Special Issue on Energy-Efficient Techniques for 5G Wireless Communication Systems), vol. 34, no. 4, pp. 735–742, Apr. 2016. Man Hon Cheung and Jianwei Huang, "DAWN: Delay-Aware Wi-Fi Offloading and Network Selection," IEEE Journal on Selected Areas in Communications (Special Issue on Recent Advances in Heterogeneous Cellular Networks), vol. 33, no. 6, pp. 1214–1223, June 2015. Bojiang Ma, Man Hon Cheung, Vincent W.S. Wong, and Jianwei Huang, "Hybrid Overlay/Underlay Cognitive Femtocell Networks: A Game Theoretic Approach," IEEE Transactions on Wireless Communications, vol. 14, no. 6, pp. 3259–3270, June 2015. Shaobo Mao, Man Hon Cheung, and Vincent W.S. Wong, "Joint Energy Allocation for Sensing and Transmission in Rechargeable Wireless Sensor Networks," IEEE Transactions on Vehicular Technology, vol. 63, no. 6, pp. 2862–2875, July 2014. Man Hon Cheung and Vincent W.S. Wong, "Interference Pricing for SINR-based Random Access Game," IEEE Transactions on Wireless Communications, vol. 12, no. 5, pp. 2292–2301, May 2013. Xiaolei Hao, Man Hon Cheung, Vincent W.S. Wong, and Victor Leung, "Hedonic Coalition Formation Game for Cooperative Spectrum Sensing and Channel Access in Cognitive Radio Networks," IEEE Transactions on Wireless Communications, vol. 11, no. 11, pp. 3968–3979, Nov. 2012. Man Hon Cheung, Amir-Hamed Mohsenian-Rad, Vincent W.S. Wong, and Robert Schober, "Utility-Optimal Random Access for Wireless Multimedia Networks," IEEE Wireless Communications Letters, vol. 1, no. 4, pp. 340–343, Aug. 2012. Man Hon Cheung, Fen Hou, Vincent W.S. Wong, and Jianwei Huang, "DORA: Dynamic Optimal Random Access for Vehicle-to-Roadside Communications," IEEE Journal on Selected Areas in Communications (Special Issue on Broadband Wireless Communications for High Speed Vehicles), vol. 30, no. 4, pp. 792–803, May 2012. Man Hon Cheung, Vincent W.S. Wong, and Robert Schober, "SINR-based Random Access for Cognitive Radio: Distributed Algorithm and Coalitional Game," IEEE Transactions on Wireless Communications, vol. 10, no. 11, pp. 3887 – 3897, Nov. 2011. Man Hon Cheung, A. Hamed Mohsenian-Rad, Vincent W.S. Wong, and Robert Schober, "Random Access for Elastic and Inelastic Traffic in WLANs," IEEE Transactions on Wireless Communications, vol. 9, no. 6, pp. 1861 – 1866, June 2010.